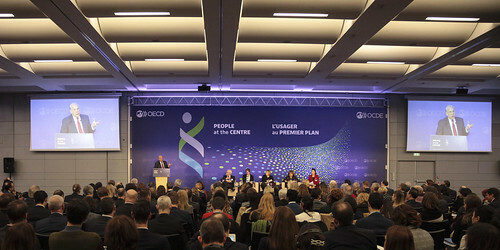 People at the Centre: Policy Forum on the Future of Health was held at the OECD Conference Centre in Paris on 16 January 2017. Over 500 participants representing civil society, patients, providers, policy makers, academics and industry came together to discuss key issues including: Harnessing digital technology and data to create proactive, people-centred systems; Caring for people with complex needs; The importance of measuring what matters to people and to patients. The Forum also featured a conversation among a small group of Health Ministers about their views on the future of health and health care. Societies and their healthcare systems are facing profound challenges, and people's needs and expectations are also changing. Meanwhile digital technology is opening new possibilities, and promising to disrupt existing processes and modalities as well as principles and beliefs. While other industries have reinvented themselves around the consumer, in health care a gap still exists between people who have one foot in the future and services that are stuck in the past. In a world of increasing complexity - as well as opportunity - our healthcare systems simply must organise around the needs of the service user. A people-centred approach promises to raise quality, reduce waste and - most importantly - improve our health and well-being. • Policies and regulation that promote team-based care designed around needs and preferences of individuals and communities. The outcomes and key messages from this event were discussed at the Ministerial meeting the following day. You can watch the video recording of all sessions in the ‘webcast’ tab below. Feel free to continue to contribute to the debate by using #FutureOfHealth.